The Processing Of Cross-Modal Emotion In teens with Autism. 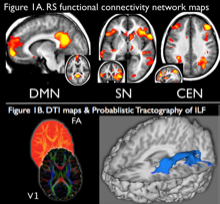 It has been proposed that the organizational structure of the brain in autism follows a pattern of high local connectivity and low long-range connectivity. We have conducted an fMRI study on crossmodal emotion matching in teens with autism and matched controls. The paradigm involved the identification of individualized thresholds for visual emotion matching, and a conjunction MRI design with both unimodal and crossmodal stimulus sets. This work will improve our understanding of multimodal processing in autism and will help inform the design of training interventions. Rumination is an important mechanism in the onset, severity and duration of mood disorders. We conducted a novel fMRI study examining ruminative thought processes in a group of young women at high risk for depression by virtue of a parent or sibling affected by MDD, and healthy controls. While being scanned, participants engaged in periods of free thought, alternating with periods of suppression of personally relevant ruminative thoughts and emotionally neutral distractor statements. This work has been done in collaboration with Glenda MacQueen of the University of Calgary. Dramatic advances in cognitive and emotional capacities of children take place during middle childhood. The proposed programme of research is aimed at discovering the structural and functional brain changes that underlie these improvements. We will use MRI to examine the brains of children age 7 to 10 years. Children will be scanned twice at two-year intervals in this longitudinal study. The study participants are being recruited from a of group children that are part of a larger study that has run for last 7 years. We will examine changes the connections of brain networks, both structurally by looking at white matter tracts, and functionally, by looking at brain activation patterns. We will explore age related changes in the networks responsible for cognitive processes like memory and inhibition. In addition, we will examine the role of these networks in emotional regulation. MRI tasks and developmental measures have been designed to be engaging and sensitive to differences in cognitive capacities. The research will yield novel and much needed information about typical child development at both behavioural and brain levels and will lay the groundwork for future research examining a number of environmental and genetic influences on brain development. Autism Spectrum Disorder is characterized by social communication deficits and stereotyped or repetitive behaviours (APA, 2011). The social deficits in ASD include difficulty understanding nonverbal communication, difficulty developing and maintaining relationships and deficits in social-emotional reciprocity. To date, there is no comprehensive computer-based social skills assessment for children with ASD. There are, however, a number of social cognition experimental test paradigms in the available literature that clearly distinguish the performances of children with ASD from their neurotypical peers. 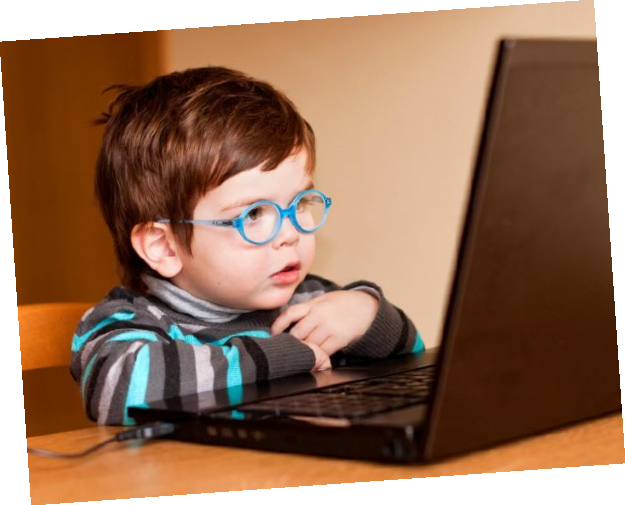 The purpose of our research research project is to build and standardized a computer-based assessment tool that directly measures the performance of ASD children on social cognitive tasks and aids in diagnosis and the development of intervention programming. The Computer-based Assessment of Social Skills in Autism (CASSA) presents children with a series of visually appealing game-like computer-based assessment modules that assess rudimentary global and local processing, emotional receptivity and detection from different regions of the face, emotion processing response conflict, visual-auditory crossmodal integration, and theory of mind capabilities in ASD and neurotypical children ages 6 to 12 years. This research has been made possible through a Mitacs Accelerate grant and our industry partner MultiHealth Systems. We have developed a new assessment tool called the International Mobile Psychiatric Assessment for Children and Teens. This assessment has been programmed onto smart phones and tablets so that children and teens all around the world can have access to mental health assessments. We have just completed data collection in Africa, assessing 200 school children living in rural geographic regions of Kenya. Though 44 million people live in Kenya, there are less than 100 psychiatrists for the entire population. We believe that access to mental health services should be available to everyone, and especially children, and that’s why we developed an easy to use, mobile assessment. The IMPACT is a newly developed comprehensive structured interview based on the new definitions and criteria of the Diagnostic and Statistical Manual of Mental Disorders (DSM-5). The IMPACT is programmed for use on standard personal mobile phones, by non-specialist interviewers. To validate the assessment tool we have also collected data using the gold-standard paper-and-pencil psychiatric evaluation, the Kiddie-Schedule for Affective Disorders and Schizophrenia.